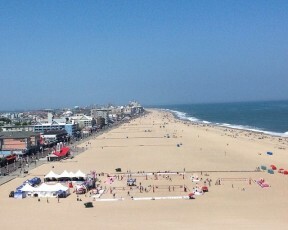 Ocean City, Md. – #NVLOceanCity competition has not disappointed on the men’s or women’s sides, with two dark horse teams hoping to make their mark on the National Volleyball League (NVL) tour this tournament. Panama City Beach champions Palm/Placek (2) will take on Russell/Schoonover (3), and Haddock/Rodriguez-Bertran (16) look to upset Keffer/Torsone (4) in the men’s quarterfinals bracket. Haddock/Rodriguez-Bertran are proving once again that they can go head-to-head with the top seeds, coming in second earlier this year at the Panama City Beach Championships. Madeira Beach champions Henderson/Marciniak (1) could still make a finals appearance but they’re going to have to do it the hard way, with two wins needed in the contender’s bracket to get into the semi-finals. On the women’s side, Panama City Beach winners Niles/Sowala (1) are looking for another title but will have to get past Fuller/Zamparelli-Flavia (5) first. Batt-Rohr/Piantadosi-Lima (2) are hungry for a repeat win coming off of the Madeira Beach Championships, and will face Hayes/Snyder (3) to battle for a finals spot. The contender’s bracket is up for grabs with Menard/Williams (4) versus Harris/Tiegs (9), and Dickson/Duke (7) versus Alfaro/Charles (16). NVL RIZE, the National Volleyball League’s official amateur series, will also host its finals on Sunday, with junior finals taking place on center court before and after the pro women’s finals. July 10-12: Milwaukee Championships – Milwaukee, Wisc.